If fine lines and wrinkles make you frown whenever you look in the mirror, Botox® injections at Plateroti Dermatology in Templeton, California, can whisk away your problem quickly and easily. Just a short series of injections keeps wrinkles in the top part of your face away for three to four months at a time. Use online booking or call Carmelo Plateroti, DO, FAOCD, FAAD, and the team at Plateroti Dermatology to schedule your appointment today. Botox® is a wrinkle-reducing injectable treatment that’s mainly used in the eye and forehead areas. It temporarily relaxes the muscles, which in turn smooths out the skin just above those muscles for between three and four months. Botox is derived from botulinum toxin, but it’s safe and effective for use in the face because the amounts used are very small. If the lines bother you and you’d like a younger-looking face, you could be an excellent Botox candidate. If you have wrinkles or folds in your lower face, around your nose and mouth, or in your cheeks, your wrinkles typically come from age-related volume loss. Botox doesn’t treat those kinds of wrinkles, but dermal fillers from Juvéderm® are often a great fit for that issue. Botox treatment is pain-free for most patients. You may experience a minor sting during the injections, but it’s over in literally seconds. At Plateroti Dermatology, all Botox treatment providers are specially trained expert injectors who strive to make your treatment quick, easy, and painless. It depends on your concerns and goals. 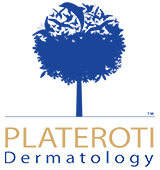 Your Plateroti Dermatology care provider explains exactly where you need injections and how many injections you need to get your desired results. Each treatment area has specific injectable points. The eye area (crow’s feet) requires three injections on each side. The between-brow area requires five injections in the muscles between and just above your brows, and the forehead area requires five injections, fanned out over a large forehead muscle. How long until I see results after Botox injections? You may notice wrinkle reduction in as little as 24 to 48 hours following your Botox injections. Many patients say that they suddenly look more well-rested, or that friends ask what they did differently to look so great. Ready to look younger? Book your Botox appointment online or by phone now.